Exploring the inner pain of the human condition and the frightening ways it can manifest when coming into conflict with our most intimate relationships, Matthew Charof’s metaphysical short Violet, sees a paranoid woman teeter on the line between reality and fantasy as she attempts to confront her boyfriend’s lover. To accompany Violet’s online premiere on Directors Notes, I spoke to Matthew about constructing a life-sized cocoon and how the film’s themes evolved across multiple, interlocking cinematic forms. I wanted to tell a story about this idea of searching for one’s self. I worked to bring that into a visual form and surrounded it with the conflicts of fighting with your boyfriend, paranoia and low self-esteem and literally chasing the thing you suspect is causing all the pain, but finding your own face staring back at you. As these experiences can be very frightening and confusing to face, I wanted to use the genre: psychological thriller, to help convey that. The mental and emotional state of humans is a very internal process and one that we can all relate to, it is something that can be very scary. This film, Violet is about the pain one feels, that develops over time, stemming in most cases from past trauma, and how that can get in the way of our relationships. 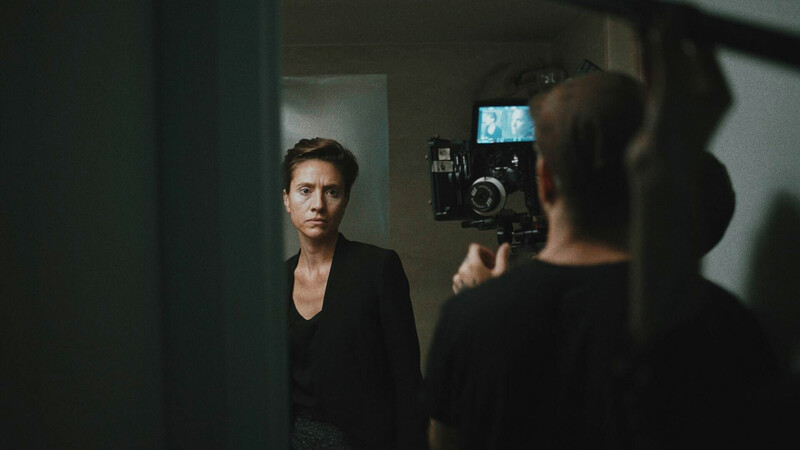 Violet was born of a circuitous route; from Matthew Gasda’s original story to short film Pale which was then expanded into a feature screenplay, and now Violet. How have the themes and narrative concerns transformed and developed across these various iterations? Pale, from the very beginning, was always a story about love. The original title was actually called The Lovers. But this was an exhausted love, as Gasda would say, and in that cycle of love versus lust, the two sides were never happy, always searching for more. So in that search for a softer, more gentle love, The Woman in White was born, the character that you see in Pale, dressed in all white, pouring the glass of water. When we wrote the feature film we brought the Woman in White with us and she started to transform into something close to an alter ego, she was another version of Violet instead of a different woman who Violet was having an affair with. The story started to transform into something that was about mental health and became scary in the way that an emotional breakdown could be. Violet the short film is basically a proof of concept for the feature Pale, all the same characters and style and themes were explored but in a very condensed version. This role required Kathleen Wise to not only convey the turmoil of her internal demons, but also play against herself at times. How did the two of you tune the volatility of her performance? I really trusted in the material and gave Kathleen the space to bring the character to the screen. She was playing two characters who had different hair and makeup and wardrobe looks and so I felt that it was important to keep things as simple as possible and tried to not over explain. She and I had worked together before and actually, this film was a big learning experience for me since she is a much more experienced actor than I am a director. So in that way, I sort of followed her lead and trusted her to take us all in the right direction. I wanted to tell a story about this idea of searching for one’s self. Could you explain how you came up with the cocoon design and what went into its construction? What’s its significance as part of Violet’s journey of self-discovery? The design of the cocoon was always something I had visualized in my mind ever since I read it on the page. I started sketching it out and began thinking about how we could actually construct it while leaving room for a human to fit inside plus design a lighting rig for it. It wasn’t until I met these two designers Oliver Allaux and Thadeus Echeverria that those ideas started to actualize. We built the cocoon in Thadues’ backyard in Brooklyn with a foam frame and crystalized textures made out of fabric. The design was based on an actual caterpillar’s cocoon that we scaled up to life size but I wanted it to have sort of a fashion aesthetic, like something you might see at a runway show at Fashion Week. It worked out perfectly that our Production Designer Syd Richardson had worked for Project Runway for many years and was able to get his hands on all these beautiful fabrics. As far as the narrative significance, this can be interpreted in many different ways, such as rebirth, but I hope that everyone can find their own connection to it and be entertained and challenged by this beautiful piece of work. How challenging was it to convey Violet’s fractured state of mind, yet keep the audience oriented in her fractious story? Once we got to the editing room, I felt that the structure of the film was a bit too linear and straightforward. I wanted it to feel more fragmented and non-linear than what was on the page. For me it always felt like Violet was trying figure out what was going on by piecing her memories back into place and so I wanted the audience to go through that same experience of realization, and puzzle piecing, so at the end when they are all sitting at the table together, we can all share that “ah ha” moment with her. I have a really fun web series coming out next week called Beam Me Up which is a collaboration with my friend Gazoo ToTheMoon. It’s part of a larger channel called Homemade Future where we tell stories in POV perspective about different artists, musicians and creative people making stuff in the industry. I am also developing a feature film with Matthew Gasda called August which I hope to share more about at a later date.